Good news for you guys… I have a SECOND awesome giveaway for you this week! It is all part of Sweet Basil’s birthday week where she is giving away some of her personal favorite things. This one is pretty dang exciting and will get you ready to roll for summer grilling! 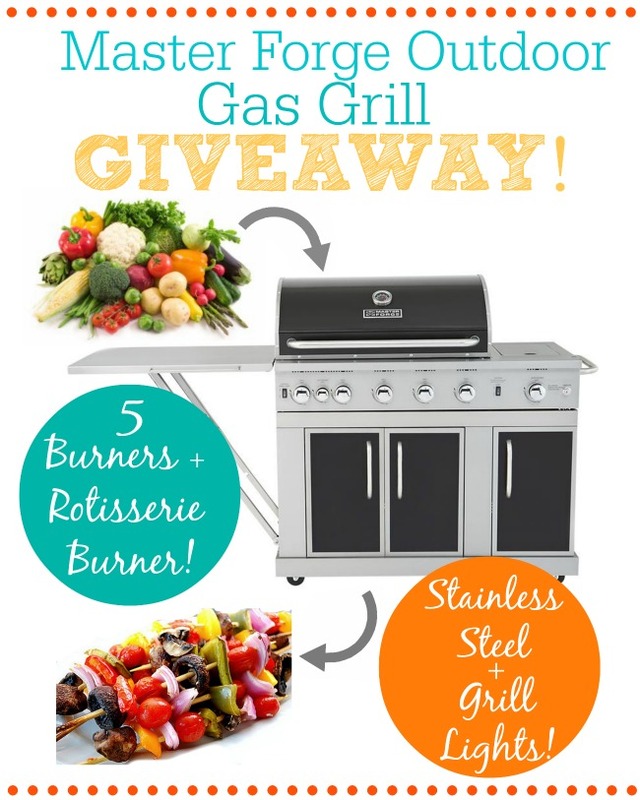 That’s right- Lowe’s is sponsoring this awesome giveaway for a grill! How exciting is that?! I am obsessed with grilling and what better way to bring in the warmer weather than to cook outside and let the heat stay out there?! I loathe turning on my stove and oven in the summer time. My house just gets so stinkin hot, so more often than not, we can be found outside grilling away. Lowe’s has kindly and generously provided the grill for this giveaway. This contest is not endorsed or affiliated with Pinterest or Instagram. My husband would be absolutely in love with this grill! My favorite thing to grill is chicken breast, veggies, and garlic bread. Favorite meal ever! Grilled fresh veggies are my favorite! Summer isn't summer until we've grilled peaches! Grilling means summertime is here! Outdoor gatherings by the pool, cold beverages and those smoky delicious smells in the air! I tried following you on instagram but you are set to private and the request is sent. Love chicken and asparagus! Yum! Love grilling greek seasoned chicken for gyros! My favorite thing to grill is well marinated meat of any kind. I would love this grill! Steaks are our favorite. nothing like grilling up burgers in the summer. thanks! It isn't summer until you've spent the evening with friends and family around a grill! Sorry - I'm supposed to tell you my favorite thing to grill. Probably corn on the cob, wrapped in foil. Now I'm hungry! Anything and everything. I love to grill meat, pizza and veggies. I love grilling! One of my favorite things about it is you can make a delicous dinner without making a huge mess in the kitchen! I love to grill burgers stuffed with cheese! So flavorful! I love grilling some kabobs or steak. I would love grilling chicken and veggies on this grill! I would love this grill! My favorite thing to grill is probably marinated chicken breasts. Love the taste of a good steak, done medium rare too! I love grilling vegetable kabobs. Anything that my husband makes on the grill is awesome! Can't beat a good steak or BBQ chicken! Vegetables!! I love grilled veggies. Wow! What a great giveaway! My mom would be so happy if I won! Corn on the cob on the grill is the BEST!! Oh how we need a new grill. I'm seeing some chicken breasts and thighs lined up on those grill grates. Wow this grill would be great for summer! Grillled veggies and chicken are my favorite! My boyfriend would love this grill! We like to grill burgers, chicken and veggie skewers. I love grilling shrimp, then throwing a bit of feta over the top before serving. The feta gives it a great flavor! It's great on chicken, too! My favorite food from the grill is turkey but steak or burgers are easier. My favorite thing to grill is burgers! Veggies, especially asparagus and mushrooms! Baby back ribs are my favorite to grill. My hubby is the grill master in the family. Nothing is better than a good burnt hot dog on the grill. I love making skewers on the grill! Summer will taste even more amazing with this grillizza! Burgers is my favorite to grill! I like grilling ribs. If you grill right your ribs can be eaten without teeth ,the way I cook them. I love a good flank steak on the grill! I must say bacon wrapped barbecue chicken is my favorite! I like to grill hamburgers. My favorite thing to grill is a nice juicy steak, or marinaded chicken with grilled pineapple and zucchini. Shish-ka-bobs! Growing up we could always choose whatever we wanted for our birthday, and I chose shish-ka-bobs almost every single time! A little labor intensive, but I love 'em! We would love this grill!! We're bug grilles too. But a classic hamburger is probably my favorite. Corn on the cob always tastes better cooked on the grill! I love grilled hot dogs!!! Steaks and veggies with grilled corn and potatoes makes a great meal. And for deddert grilled peaches or plums really makes life great. steaks! and that grill is a thing of beauty! Grilled Fruit Kabobs are fun! Shish ka bobs are my fave! Salmon with lemon and pepper! We make up veggie packs with sliced potatoes, zucchini, yellow squash, onions, butter and overloaded seasoning. Yum! It is supposed to be everglades seasoning. Sorry. Auto correct. I love to grill pineapple, pizza and vegetable kabobs on the grill in the summer. I love shish kebob on the grill! We love grilling summer vegetables. I love cheeseburgers on the grill! My favorite thing to grill is pizza. burgers and hot dogs! I'm not a big fan of hot dogs normally but when they're fresh off the grill it reminds me of being a kid! I like to do chicken on the grill. It's beginning to feel more like spring! Such an awesome giveaway. I hope I get to try some of your delicious recipes on this grill! Salmon is wonderful on the grill. I like to cook a snoek on the grill. Cedar Plank Salmon is definitely one of my favorite things to grill. So flavorful!! Love grilling steak tips and fresh veggies! Steaks! my husband has a steak butter recipe that is amazing! This would be an awesome grill to win. We love to grill all summer long. We love the grilling season, but I have to say our favorite is burgers. There are some many options. A perfect gift for my husband on Father's Day!! I love to grill everything! I think grilled pizza may be my favorite though! My favorite thing to do is grill...doesn't matter what it is. It makes life during the summer so easy! My favorite thing to grill is kabobs. We love to cook salmon on the grill.